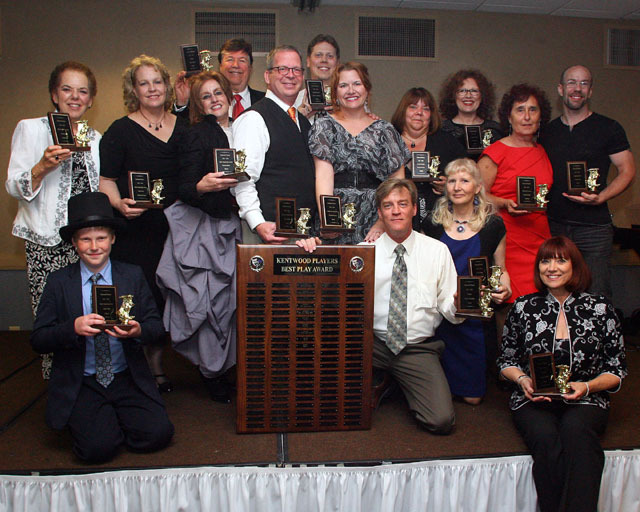 2011-2012 Marcom Masque Award winners (left to right): Marlene Grinde (accepting for Kenny Allen), Logan Gould, Valerie Ruel, Patricia Butler, Rocky Miller, Ben Lupejkis, Shawn K. Summerer, Elizabeth Bouton, Harold Dershimer, Kathy Dershimer, Catherine Rahm, Jayne Hamil, Deborah Ishida, Victoria Miller, and Robert Davis. The 2011-2012 Marcom Masque Awards Dinner and Awards Ceremony was held on Saturday, June 23, 2012 at the Four Points by Sheraton Hotel in Culver City. The event chairpersons were Shari Barrett and Linda Reinhardt, with Susan Goldman Weisbarth and Scott Martin directing the entertainment portion of the event. Calia Mintzer-Wolf managed the guest list, and Jayne Hamil was the event’s Mistress of Ceremony assisted by Gail Bernardi. Best Actor in a Leading Role Ben Lupejkis as Fagin in Oliver! Best Actress in a Leading Role Elizabeth Bouton as Nancy in Oliver! Best Actor in a Major Supporting Role Logan Gould as Artful Dodger in Oliver! Best Actress in a Major Supporting Role Patricia Butler as Widow Corney in Oliver! Jennifer Richardson as Bet in Oliver! Best Actor in a Minor Role Shawn K. Summerer as Knife Grinder in Oliver! Candice Courtney as Rose Seller in Oliver! Best Director Harold Dershimer for Oliver! Best Producer Rocky Miller and Victoria Miller for Oliver! Best Set Design Michael Allen for Oliver! Best Lighting Design Robert Davis for Oliver! In addition, a Special Board Award was given to Russell Ham by the Kentwood Players Board.